Bega Valley Shire Library has an increasing program of creative activities across the Shire for all ages to become a part of. The newest of these is the Tura Marrang Painters Group who meet on the first and third Thursday of each month. In a partnership with the Merimbula and District Arts club the Group is for artists of all ages who wish to take a break from their studio and paint for a day with other artists and share techniques and concepts. The days run from 9.30am to 2.00pm with a gold coin donation. Contact Lynda Plummer for more information on 0407 898 774. The Tura Marrang Quilters group meet on the first and third Tuesday of each month at the Tura Marrang Library and Community Centre from 10.00am until 2.00pm. Participation is free and the group welcomes any textile crafts people. The group currently has an amazing array of work on display at the Tura Marrang Library. Contact the Library for more information 6499 2340. For Bega people there is the Knitting and Crochet Group who meet each week on a Tuesday morning from 10.00am – 12.00pm at Bega Library. Grab your knitting needles and crochet hooks and get amongst it! 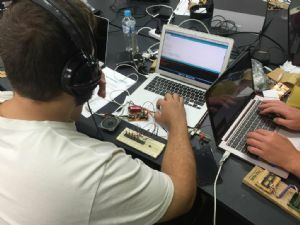 The Coding Night at Bermagui Library on the third Thursday of each month is an option for the tech heads in the community. Running from 5.00pm until 8.00pm the night is for people of all ages who are making digital things or want to know how to make digital things or need some help with a digital solution. The community are really behind it with more than twenty people attending each night. There is even a local high school teacher working with local kids on how to program using Scratch. The Principal from Bermagui Primary has lent the group their Sphero robots on occasion and a local IT developer has been sharing his experiments with VR and Arduino chips. The Coding Night is free and if you have any interest in the digital realm drop in and be a part of the technology revolution. Contact the Library for more information on any of these exciting creative pursuits 6499 2127.